2016 opened with the death of Pierre Boulez; alas, it has only got worse. One might have wished for more from the Proms, at which he conducted about seventy concerts, from 1965 to 2008: a much-needed London Répons, for instance. Let us not, however, be ungracious; this was nevertheless a moving and necessary tribute. It was, moreover, definitely a tribute to Boulez at the Proms, both as conductor and composer. Bartók always featured heavily in his programming, here and elsewhere; indeed, out of the three previous performances of the Three Village Scenes at the Proms, two, in 1974 (the first ever) and in 1979, the latter with the newly formed Ensemble Intercontemporain, were conducted by him. It is always a great pleasure to welcome the EIC to London. Does it ever give a less than excellent performance? That was certainly not a question that occurred this evening, under Baldur Brönnimann, even if I wondered whether the frenetic passages in the opening ‘Svatba’ (‘Wedding’) were a little too driven. Perhaps it was just the acoustic, or the time needed to come to terms with it. At any rate, the contrast with the broader, weightier passages was stark. The second scene, ‘Ukoliebavka’ (‘Lullaby’) sounded as a lullaby indeed, but not an easy one. Languor, whether from the instrumental ensemble or the female voices of the BBC Singers, was always shot through with unease, even urgency. Woodwind echoes of Bluebeard’s Castle – a work I heard Boulez conduct both here and elsewhere – proved as mesmerising in their way as the ‘real thing’. Echoes of Les Noces, another favourite Boulez work, were clear throughout too, nowhere more so than in the ‘Tanec mládencov’ (‘Lads’ Dance’). It was raucous, yet controlled: art music, not folk music, and rightly so. Precision and spirit, rhythm and harmony: all contributed, as they might have done under Boulez himself, to a splendid performance. Anthèmes 2 was heard here in 2012, as part of Daniel Barenboim’s Beethoven and Boulez series. The violin soloist was then Michael Barenboim; here, Jeanne-Marie Conquer proved an excellent, perhaps even superior, successor. The Royal Albert Hall truly came into its own, as much a partner, so it seemed, as the ever-excellent IRCAM sound team. A truly spatial work emerged, a successor as much to Gabrieli as to Stockhausen in that sense; above all, however, this was a performance whose material and its proliferation could only have been that of one composer. At times, we heard a celestial band of violins in sweet harmony across the hall; at others, we heard individual responses from a host of individual pizzicato strings (or so, of course, it seemed), ricocheting in endless variety, endless variegation, serial processes rendered as immediate, as immanent as anyone might imagine. New vistas opened up, the timbral equivalent of one of those moments in a Mahler symphony. Bach’s example seemed perhaps unusually present, but so did difference from that (unacknowledged?) model, that figure we know and love from ‘…explosante-fixe’ taking on roles both familiar and new (even to those of us who thought we knew the work quite well). ‘Mesmerising’ again seemed the word. 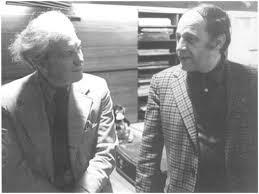 Boulez and the EIC gave the premiere of Elliott Carter’s Penthode at the Proms in 1985. It does not, sad to say, seem to have been performed there since; it was certainly the first time I had heard the work live. What a work it is, though, and what a performance it received too! The opening viola solo, gorgeously played, sounded almost Bergian in its inspiration, its melodic path, even some of its harmonic implications; likewise when the violin took over, only underlining a perhaps surprising closeness to the world of Berg’s Violin Concerto. As in a work by Boulez, the line was in a state of constant development, the mode of development itself constantly developing. Energy might have been less overtly to the fore than in some of Carter’s works, but was no less crucial, if anything more so, in what I sometimes thought of as a state of rapt development. It was not unlike, if you will forgive me the fancy, a great Beethoven Adagio, in which variegated (Carter’s equivalent to Boulez’s ‘proliferating’?) material above wove its particular magic, yet remained, however intangibly, dependent upon the slower movement – a geological metaphor did not seem inappropriate – below, movement that remained, one felt, in some sense fundamental. I wished it might have gone on longer, even forever. Likewise with Boulez’s cummings ist der Dichter, for which the BBC Singers, this time male and female, returned to the stage: twenty-seven singers and twenty-seven instrumentalists, the three harps pointing to the future of sur Incises. Although it has featured four times at the Proms, the first time (1972) conducted by the composer, this was, I think, the first time I had heard the work in concert. Rectification of a rare omission was all the more welcome in so sensitive, so wondrously clear a performance. One is on dangerous ground, pointless ground perhaps, saying that the composer would surely have approved, but it was difficult not to do so, and surely harmless to think in such terms. I had the impression of a combination of certain qualities of Boulez’s earlier choral music – think of the ravishing world of Le Visage nuptial – with the different concerns of somewhat later musical language. Words were admirably clear, even when, especially when, broken up: it is not a Nono-like path that is followed. There was a true sense, nevertheless, of cummings-like wonder. The work sounded, if not unusually generative in its processes, than perhaps unusually traditional in the nature of those processes. Such things are highly relative, of course, but the impression of anchoring was not at all unwelcome. Brönnimann’s strong sense of direction was palpable, as was the security of every performer. Such qualities sounding as a given, a gorgeous tapestry indeed could be woven above, within, without, beneath. There were passages of relative stillness (again, relative), but there was always something brewing, somewhere. As with the preceding works, the scale, as well as the stature, of work and performance had little or no connection with its mere duration.